PORTLAND, MAINE — APRIL 5, 2016 —The idea of using food to improve personal health has fueled consumer interest in less processed, authentic food and has spurred the surge in food trends like organic, GMO-free, paleo, and all-natural. As shoppers choose real unadulterated foods, major packaged food companies are reeling from lost market share and working hard to recast their tried and true recipes – removing synthetic coloring, dyes, artificial preservatives, artificial ingredients, and GMOs in an effort to create cleaner, simpler labels. As large restaurant chains and packaged food companies scramble to meet the demands of today’s health conscious consumers, another food trend is emerging. According to Portland Marketing Analytics, a Maine based marketing research firm, “Wild foods are about to crash onto the American stage and a few indigenous ingredients, such as wild salmon, seaweed, and Wild Blueberries, are clear standouts,” said Chris Clegg, a Portland Marketing Analytics principal and specialist in measuring the impact of consumer insights and market trends. Recognizing a lack of awareness about indigenous foods and a need to educate consumers, food manufacturers, and food-service providers about their appeal, the Wild Blueberry Association of North America engaged Portland Marketing Analytics to conduct a three-phased nationwide study of over 1,000 U.S. consumers. The Power of Wild is a first-in-the-nation study that explores consumer attitudes toward wild foods. “Wild” also resonated with all consumers when considering health and taste benefits. This was especially strong among the Lifestyles of Health and Sustainability (LOHAS) consumer, which represents 41 million (or 1 in 4) adult Americans and a $290 billion U.S. market. Phase two and three of The Power of Wild research took a look at consumer preferences for foods containing wild vs. cultivated ingredients – specifically wild blueberries vs. cultivated blueberries. Participants were shown images of five food categories: Smoothies, Muffins, Jams/Preserves, Yogurt and Ice Cream/Frozen Yogurt that would commonly use blueberries as an ingredient and asked a series of questions. In each instance, one of the products in the category was labeled Wild Blueberries and the other with regular, cultivated blueberries. 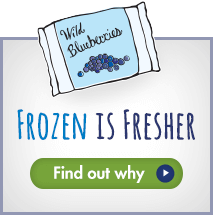 Consumers had a more positive reaction to the products labeled with Wild Blueberries and the results were consistent across all the categories tested. The results revealed that consumers were more likely to buy products containing Wild Blueberries vs. regular blueberries and they would buy more of those products and pay more for them. LOHAS consumers reported stronger preferences for Wild with 70% saying they would buy more and 62% willing to pay more. In some rapidly growing health categories like smoothies, the consumer preferences for Wild Blueberries vs. regular blueberries were even more pronounced. Panera Bread® is just one example of a company already using wild ingredients, and it is quickly distinguishing itself as a forward-thinking chain with a ‘Food As It Should Be’ mantra. According to Head Baker Tom Gumpel, who developed the recipe for Panera’s winning Wild Blueberry Scone, “We rotate flavors out seasonally, but that one scone – I couldn’t get rid of it – there would be a backlash from our customers.” In fact, the Wild Blueberry Scone has been a star at Panera for years; the restaurant chain sells tens of thousands of them each week at its nearly 2,000 bakery-cafes across the U.S. and Canada. With its simple list of recognizable ingredients, The Wild Blueberry Scone not only adheres to Panera’s “clean commitment,” but it has become something of an emblem of that initiative. To help raise awareness for this growing wild foods trend, the Wild Blueberry Association of North American has kicked off a multi-year educational campaign designed to inspire a national discussion about the power of wild foods. Among them, Mary Ann Lila, Ph. D and director of the Plants for Human Health Institute at North Carolina State University and one of the nation’s preeminent Wild Blueberry experts. Lila has devoted her career to understanding the health benefits of wild foods: “A wild plant can’t just get up and walk away when confronted with a stress,” she notes. “It has evolved over thousands of years to combat stress by producing powerful phytochemicals to protect itself. These are the same natural plant compounds that protect us from inflammation and chronic disease when we eat wild foods.” Lila’s research reinforces that wild foods, such as Wild Blueberries, produce higher concentrations of phytoactive chemicals than are typically found in ordinary cultivated foods, such as cultivated blueberries. The Wild Blueberry Association of North America is a trade association of farmers and processors of Wild Blueberries from Maine and Canada who are dedicated to bringing the Wild Blueberry health story and unique Wild Advantages to consumers and the trade worldwide. WBANA is dedicated to furthering research that explores the health potential of Wild Blueberries. Every year since 1997, WBANA has hosted the Health Research Summit in Bar Harbor, Maine, a worldwide gathering of renowned scientists and researchers whose work is leading the way in learning more and more about the health benefits of Wild Blueberries. Hundreds of studies have been conducted on the potential health and disease-fighting benefits of Wild Blueberries. For news, recipes, and related health information about Wild Blueberries, visit www.wildblueberries.com. For the latest updates, read our blog. Visit us on Facebook or on Twitter.